The USS Stennis and other ships sailed through the Strait of Hormuz unannouced today, putting the largest fleet of US Naval strike forces in the Gulf of Oman since 2003. 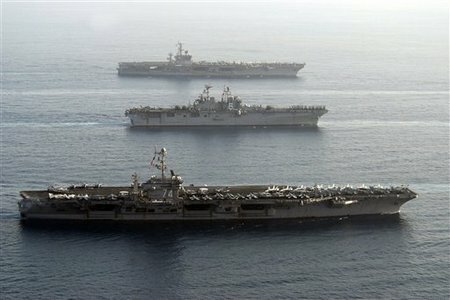 The USS Nimitz (CVN 68), the USS Bonhomme Richard (LHD 6) and the USS John C. Stennis (CVN 74) are side by side in the photo, each is the flagship of a different naval strike group. The 9-ship force includes landing ships carrying 17,000 Sailors and Marines.